We offer our clients jaipura granite stones that collected from the western peninsular region of India. 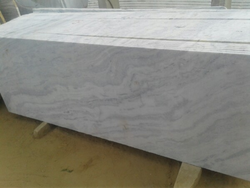 these granites are offered in the form of blocks nad slabs and calibrated to suit the specific requiremenst of our clients. being extensively hard and durable, these granites are used for flooring and making counter tops. Available in stylish patterns and colors, Granite adds an ethereal touch to any surrounding. Our quality Granite's rich colors, stiffness and density, makes it an ideal choice for flooring, counter tops, vanities as well as exterior applications. Flowery Gold is a Limestone mined in the state of Rajasthan in India. It bears dark and light yellow cloudy pattern. Ideal for flooring, wall cladding, landscaping and counter tops. Granite is nearly always massive (lacking any internal structures), hard and tough, and therefore it has gained widespread use throughout humanity, and more recently as a construction stone. The average density of granite is between 2.65 and 2.75 g/cm3, its compressive strength usually lies above 200 MPa, and its viscosity near STP is 3–6 •Melting temperature is 1215–1260 °C.